Chris Doyle coming through with a fresh round of the Palaver Podcast where he sat down with Kink BMX Team Manager and all around good dude, Jay Roe to get to know him a little better. This one kicks off with some pretty surprising history that Jay was actually a really good hockey player when he was in high school and that’s pretty mind blowing that even I had never heard about before. After that we get a look into more of the BMX side of his life, what his job is like, travelving and much, much more. This is a super good listen, so hit play and enjoy! Once again, REAL stoked to see Chris uploaded this to Youtube. The crew at Kink are getting a jump on 2020 and dropping their full line of 2020 Complete Bikes in May! As expected, they have a full line of complete bikes that are incredibly dialed and cover everything from the 12″ balance bikes all the way up to the signature completes that are pretty much a custom build straight out of the box to their 26″ Drifter for the people looking to cruise. Check out the full bike line in the flipbook below, or hit up the Kink Website for a detailed look at every bike in the line! What do you think of the bikes? Any in particular you really like? Let us know what you’re thinking in the comments below! Kink have teamed up with Roc City Skatepark to do a collaboration t-shirt to help raise funds for the park! This shirt is printed on a 100% combed ring-spun USA Premium cotton 4.3 oz. 30 sing fine jersey knit blanks that are pre-shrunk, tailor fit, side seamed, double-needled on the sleeves and bottom hems with a ribbed crew neck and taped shoulder to shoulder. There’s a small logo up front (lower photo) with a larger logo on the back (top photo). In short, this is a high quality t-shirt with a rad logo that is going toward a good cause. The shirts are available in Black only with sizes Small – XXL available for $21.99 in the Kink Webstore. 100% of the proceeds from the sale will go to Roc City Skatepark. What do you think of the shirt? Do you have any questions? Let us know in the comments below! Kink coming through with a short but sweet promo giving you a look at their new Spring / Summer 2019 Apparel line with the team doing a little modeling during a grill out! Everything in the video is available now and you can get a closer look over on the Kink website! Check it out! “The new collection of SS19 Kink BMX Apparel is in stock and available now at Kinkbmx.com! Just when you thought you had it figured out that it was 2019, the crew at Kink drop the first look at their 2020 Complete Bike Line! As always, Kink delivers a full line of bikes from the little 12″ Coast all the way up to the brand new, very dialed, Nathan Williams Signature Complete to the 26″ Drifter. There’s a BMX bike that’ll work for every rider in the line up. You can get the first look at all of the bikes over on the Kink Website! These bikes can be pre-ordered through BMX shops and mail-orders that carry Kink worldwide now, and they will be available just in time for the summer sessions! Oh hell yeah! Kink dropped this new banger of a video featuring Nathan Williams putting his new signature The Williams Frame and Bars to good use! This one has a pretty funny intro and ending, but the riding is pure fire. Check it out, then learn more about the frame and bars over on the Kink website! Here’s something we’re sure a bunch of you will be stoked on. The Nathan Williams signature line from Kink has arrived. Here’s a look at The Williams frame and bars that are landing at BMX shops and mail-orders worldwide now! The Nathan Williams signature frame is made from 100% seamless 4130 Sanko chromoly tubing with a 75.5-degree head tube angle, 71-degree seat tube angle, 11.7″ bottom bracket height, 9″ standover height and a 12.75″ (slammed) chainstay length. The frame features an integrated head tube, gussets on the top and down tubes, double butted top and down tubes, an Integrated seat post clamp, a Mid bottom bracket that has been internally and externally machined, a CNC machined seat stay bridge with a Kink badge inlay, oval chainstays with plenty of clearance for huge 2.50″ tires, Anti-Slip dropout knurling, integrated chain tensioners and removable brake mounts! The Williams frame is available in ED Black, Colorado Yellow and Translucent Blue with a weight of 4 lbs. 15 oz. (20.75″) and can be yours for $329.99! Integrated head tube with the gussets and double butted top and down tubes for a strong front end! How good does that CNC machined seat stay bridge look with the inlay Kink badge? Knurling on the inside of the dropouts to help keep your wheel from moving. That’s a look at the The Williams frame! You can pick this frame up for $329.99 through BMX shops and mail-orders that carry Kink worldwide now. You can also find it in the Kink webstore! If you’re going to pick up The Williams frame, you might as well get the bars, too! The Williams bars are made from 13-butted, TruTherm Post-Weld Heat-Treated 4130 chromoly with a 9.25″ rise, 29″ width, 11-degrees of backsweep and 1.5-degrees of upsweep. You can pick these bars up in Black, Chrome and Gold with a weight of 27.8 oz. for $64.99 – $74.99 depending on color! The Williams Bars are available through BMX shops and mail-orders that carry Kink worldwide now. You can also find them in the Kink webstore as well! 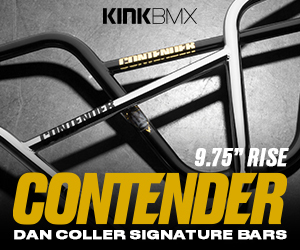 So that’s a look at the new Nathan Williams signature The Williams frame and bars from Kink! What do you think? Do you have any questions? Let us know what you’re thinking in the comments below! You can learn more about Kink and check out their full range of products on KinkBMX.com now!